Google will host an event next week to talk about the "next dimension" of Google Maps--five days before Apple is expected to ditch the service in favor of its own mapping product for iOS at its WWDC. A report by 9to5Mac last month claimed that Apple will drop Google Maps in the next version of iOS, and will instead use a homegrown mapping service. Apple has acquired several companies in the mapping space over the last few years, and may finally be ready to give Google Maps the ax. Google may be trying to preempt Apple's announcement with promises of grand new features. 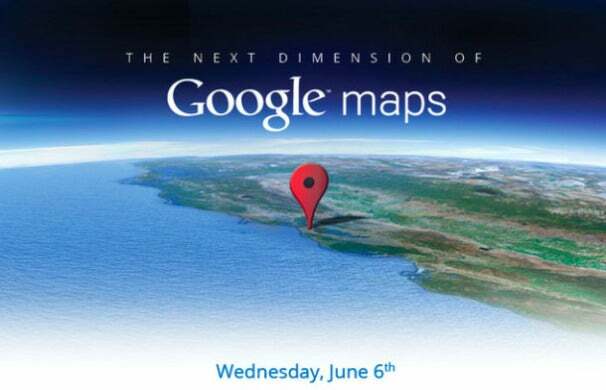 It's anybody's guess what Google will announce, but given the term “next dimension” on the invite, we may see some new 3D mapping akin to what Apple is rumored to announce for iOS6. Also, the place marker icon on the invite image is the same one that Google uses to denote local businesses. It's possible that Google will expand local business search within its Maps app and provide more recommendations on where to go. The language in the invitation--”help people get where they want to go”--lends some credence to this theory. Google has also done a lot of work with indoor maps, including floor plans and interior views, so we might see these features expanded to more retailers and highlighted more prominently in Google's mobile apps--but all this is speculation on my part. Mapping and navigation are among the most valuable tools in any smartphone, so it'll be interesting to see what Google and Apple come up with. Stay tuned.